The Johnson Amendment – Clear Voice, Inc.
President Trump signed an executive order on May 4, 2017 instructing the IRS to relax their enforcement of the Johnson Amendment. Since the Johnson Amendment is a provision of the US tax code, in order to fully repeal the law, Congressional action is required. That 1954 amendment to the IRS tax code was a constant source of friction between the IRS and 501(c)(3) organizations, especially religious ones. Leaders of those organizations were not allowed to endorse or oppose political candidates without endangering their tax exempt status. Religious leaders have long opposed the amendment saying it restricts their freedom of speech rights. Over the last several years, Pulpit Freedom Sundays have been a part of the Evangelical landscape in an effort to focus attention on the alleged unconstitutionality of the amendment by having pastors give politically charged sermons from their pulpits. Alliance Defending Freedom is the organization behind the late September, early October initiative. They believe that Caesar should take care of its own affairs and leave the affairs of the church to the church. The IRS should not be restricting what can be preached from a church pulpit. America’s pulpits had been free since the American Revolution but in 1954, that freedom was lost. With the signing of the executive order by President Trump, some religious leaders expressed relief while others said it didn’t go far enough. Alliance Defending Freedom’s Senior Counsel Gregory S. Baylor had a different view. “During his campaign, President Trump stated that the first priority of his administration would be to preserve and protect religious liberty. In speeches, he said the Little Sisters of the Poor and other people of faith will always have their religious liberty protected on his watch and will not have to face bullying from the government because of their religious beliefs. Religious voters took him at his word, giving the president a mandate to affirm and protect Americans’ first freedom. 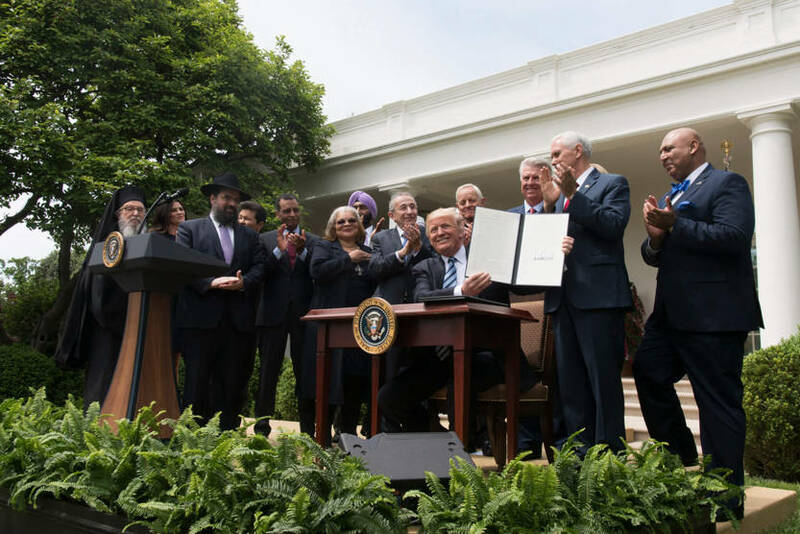 “The current outline of the Religious Liberty Executive Order released by White House officials recalls those campaign promises but leaves them unfulfilled.” Baylor then cites several examples the executive order fails to address. Legislative action, said Baylor, is needed to fully repeal the Johnson Amendment. Those concerned with religious liberty and religious freedom see a double-edged sword here. On the one hand, the First Amendment of the Constitution states that “Congress shall make no law respecting an establishment of religion, or prohibiting the free exercise thereof;…” Congress, in the Johnson Amendment, was prohibiting the free exercise of religion by threatening church organizations with the loss of their non-profit status if they engaged in preaching politics from their pulpits. But sadly, the opposite effect will likely be the outcome. Whenever the church becomes more vocal in preaching politics its religious mission suffers. The church becomes more involved with the concerns of Caesar than the salvation of the lost, the real concern of God. Politicians tend to court the favor of the church and the spirit of worldly compromise tends to leaven the church more than the church impacts the world. There is a danger that religious organizations will use their new found freedom to push for further benefits. And in a crisis, religious influence on government action rarely ends well.